In celebration of Barbie's 50th Anniversary, designer Jonathan Adler paid tribute by creating a life-size Barbie Malibu Beach House. 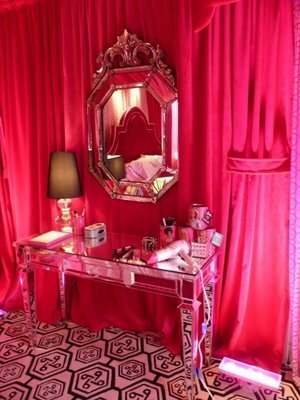 The Palms Hotel in Vegas took inspiration from Adler's design and recreated a suite in honor of Barbie (photos are a mixture of the original Jonathan Adler beach house as well as from the hotel suite). When I came across the design, I knew right away - I would recreate a room like this for my oldest daughter. 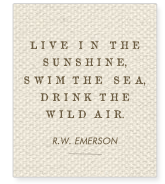 I've been collecting inspiration ever since and I thought I would share it with you. 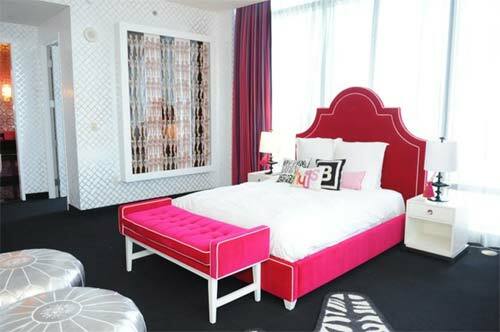 I am having two twin beds made to mimic the bed shown above with hot pink velour and white piping. Below is a Jonathan Adler lucite bench topped with sheepskin from Neiman Marcus that will sit at the foot of each bed. 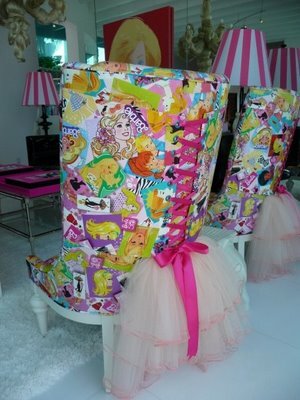 One of my favorite pieces from the suite were these adorable corset chairs upholstered with retro Barbie fabric and tulle skirts. I plan to use this as the vanity chair in the room. The vanity itself will be mirrored with a Venetian mirror above to match. I plan on putting the pink poodle statue to the right of the vanity...or maybe the left. Here are the poodle statues I hope to use, flanking the fireplace. I am going to have a muralist recreate a Barbie Warhol on the wall, similar to the photo above, but in a series of four. I can't wait to show you the finished product. Stay tuned. 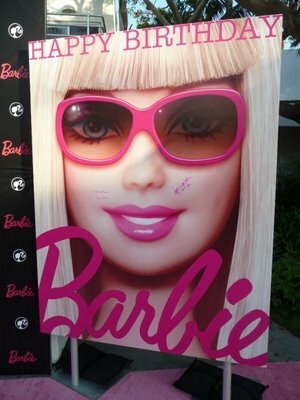 And Happy Birthday Barbie!